When The Takeout spoke to Shaya by phone, we expressed some regret for reducing his considerable accolades to a single dish, like calling Blur the band that did the “Woo-hoo!” song. We asked if he was okay talking about hummus ad nauseum. The Takeout: It took years for you to refine your hummus technique to where it is today. Can you talk about some of the discoveries during that process? 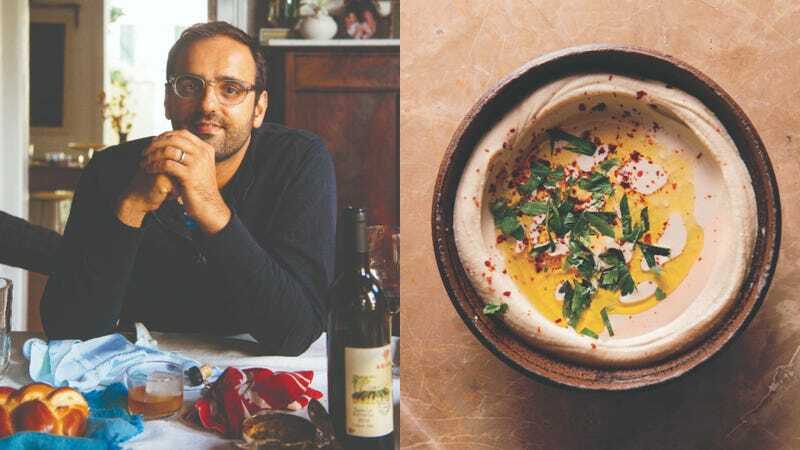 Alon Shaya: When I started cooking Israeli food, that’s when I started to practice the hummus recipe. And I feel like it’s continued to get better because we continue to refine the technique. Now, it’s the best it’s ever been. It came down to a simple equation: To get the hummus to be as smooth as it can be, you need to get as much skin off the beans. We began thinking of ways to get the majority of skins off. Soaking them in water with baking soda helped. We used to just soak and boil them to remove as many skins as we could, and we found that it was too hard to get enough off. So then we sprinkled with baking soda and tried baking it. The alkaline helped break down the texture on the skin. And then the secret after that was to rinse it all off because we didn’t want to taste the baking soda. And then we found that as you rinse it and massaged it, a lot of the skins will fall off. That was the big reveal: the dry roast and the massaging under running water. So then, the question was do you have to take every piece of skin off? That would take forever if you’re making 20 gallons at a time at the restaurant. So we thought to put it back in the water, simmer it, and skim for the skin as we’re stirring the beans. We measured how many skins come off the beans before we made the hummus, which allows to achieve that consistency. From Alon Shaya: Hummus wasn’t always ubiquitous, the way it is now. I can remember when you could buy it only at Middle Eastern grocery stores; now people are seasoning it with Sriracha, mixing it with guacamole, making it with black beans—you name it. With its simple flavors and the creaminess from tahini, it’s not hard to like. But when’s the last time it was so good you wanted to eat it with a spoon? This one is the ticket. You’ll see several details that you may not have encountered in past hummus-making adventures—baking soda plays a prominent role, and a fine-mesh strainer comes in handy—but those steps go the extra mile to make it something people remember and celebrate. At my restaurant Shaya, we treat it like a blank canvas and top it with everything from lamb ragu to seasonal vegetables. The simplest way to dress it up is with a big dollop of prepared tahini, but that’s hardly necessary. 1. In a large bowl, combine 1 1/2 quarts water and 1/2 teaspoons baking soda; add the chickpeas and soak overnight. 2. Heat the oven to 400 degrees Fahrenheit. Drain the chickpeas, and toss with two teaspoons baking soda, then spread in a single layer on a rimmed baking sheet, and roast until the beans have visibly dried, 10 to 15 minutes. 3. Move the chickpeas to a large sieve or colander; with cold water running over the chickpeas, start roughing them up with your hands to loosen the skins. You can grab a small handful and briskly run them between your palms, or pinch them between your fingers (don’t worry about removing and discarding the skins yet). The more you do now, the more will come off during cooking, so take some time here and don’t worry if they split. It’s good to be thorough—this is like giving them a deep-tissue massage to loosen everything up. 4. Combine the remaining three quarts water with the remaining 1/2 teaspoon baking soda, this time in a pot. Add the chickpeas, and bring to a boil over high heat, then reduce the heat to medium. With a small sieve or slotted spoon, skim away the foam and loose skins from the top of the water and discard. It may be helpful for you to reserve the discarded skins in a bowl to track your progress; with enough persistence, you’re aiming to have about 3/4 cup of skins by the time you’re finished. 5. Every couple of minutes during the cooking process, strain away the skins by plunging your sieve deep into the pot and giving a good stir, then using the sieve to catch the swirling skins, as you would fish for minnows. It’s okay to beat the chickpeas up a little against the side of the pot to speed this along. Repeat this process as much as you have the patience to do (you won’t get them all, so don’t drive yourself insane), until the chickpeas are just becoming tender, in 20 to 25 minutes. 6. When the chickpeas are still sort of “al dente,” give them one last skim to trap any skins, then add the garlic. Cook for another 25 to 30 minutes, until the beans are super-creamy. Drain, and let them sit in the strainer for a few minutes, so any extra moisture can evaporate. 7. Combine the chickpeas in a food processor with the raw tahini, lemon juice, salt, and cumin. Process for several minutes, until the mixture is incredibly smooth. With the machine still going, stream in the canola oil, hot water, and two tablespoons olive oil. Let it rip—there’s no way to over-process this stuff, and you want it to be as light as air. a well in the center, and fill it with prepared tahini if you’re using it. Drizzle with the last three tablespoons olive oil, and scatter the parsley and Aleppo pepper on top. Excerpted from Shaya by Alon Shaya. Copyright © 2018 by Alon Shaya. Excerpted by permission of Alfred A. Knopf, a division of Penguin Random House LLC. All rights reserved. No part of this excerpt may be reproduced or reprinted without permission in writing from the publisher.